My fruit basket often has bananas. There are times when you find the bananas have turned ripe or overripe and are still sitting in the fruit basket on the kitchen counter or dining table and you just keep wondering what to do with them. Yes, you can use them in your pancakes, smoothies, shakes, bake a banana cake, banana bread, pies, tarts or make a pudding. If you want to see them disappear quickly then just convert them into a wholesome and indulgent ice cream. Mix the sugar with corn flour and salt in a saucepan. Stir until well blended and smooth. Cook over low heat, stirring continuously for about 30 mins. or until the custard thickens and coats the back of the spoon. When cool, chill the custard for about 2 hrs. Meanwhile, line a baking tray with foil. Pierce the bananas through their peels at intervals and roast in the oven at 180C for about 30mins to an hour depending on how ripe the bananas are. Puree the roasted bananas in a blender and then chill it before adding it to the custard. Blend cream, chilled bananas and the custard. Freeze the ice cream. 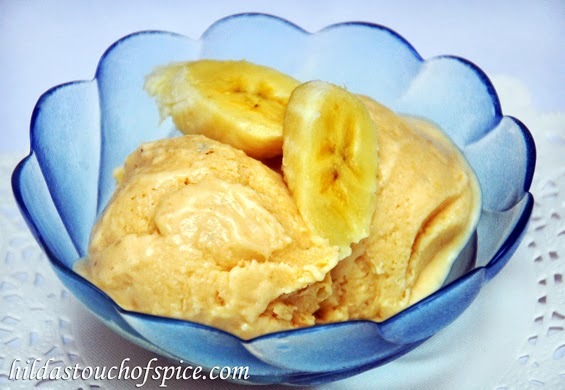 Soften the banana ice cream for about 15 mins. before serving. Serve in chilled cups/ bowls or in waffle cones.